Late Thursday night, I received an e-mail from cookbook author Joan Nathan, telling me she’d canceled her plans for Friday. 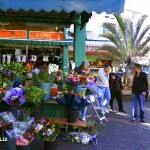 Would I like to visit the Tel Aviv farmer’s market and Bnei Brak with her? Geez, what a question! Of course I would. But there was a catch. There’s always a catch. She gave me a call the following morning, and we made plans to meet in half an hour. Did I know where we could find good Ashkenazi food in Bnei Brak? Because she didn’t. Could I find some places? Now, I’d never been to Bnei Brak before. Yes, the city borders Tel Aviv to the east, but the two are about as different as night and day. Tel Aviv is vehemently secular, while Bnei Brak is ardently religious. It’s safe to say that most people living in Tel Aviv never venture into Bnei Brak, not even to eat. Now, when Ben and I lead food tours, we generally read up on the subject and then go try multiple potential places ourselves before we return with groups. The process takes several weeks, if not months. But 10 minutes to plan a tour for one of the foremost Jewish food experts, in a place I’ve never been? Eek! Thankfully there’s the Internet. Or more precisely, thankfully people named Gili Mazza and Rami Simani wrote articles for Ynet on walking tours and food in Bnei Brak (in Hebrew). I scribbled down some addresses, and ran out the door. And it worked. Joan, her friend Mark Furstenberg and I found three great family-owned delis, and I tried more Ashkenazi food than I ever have before. And I met Tel Aviv’s eastern neighbor for the first time. Ashkenazi food has been somewhat shunted aside in the mix that makes up Israeli cuisine, and as Joan said, it’s a hard cuisine to do right. With roots in Eastern Europe, it can be heavy, and it uses few vegetables or spices. In mixed Ashkenazi-Sephardi marriages, it’s the Sephardi food that wins out (another truism from Joan). 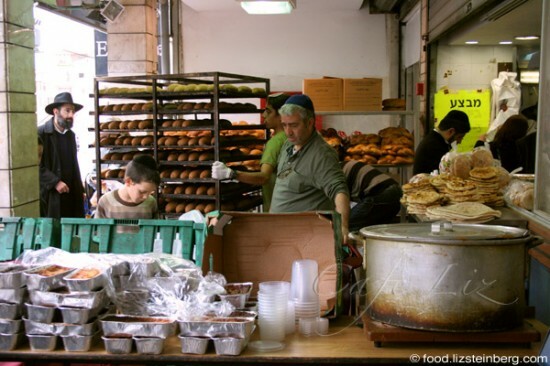 But Bnei Brak is home to a large, relatively insular ultra-Orthodox community, and Ashkenazi delis abound. Beyond the food, one of the most interesting things for me was observing how Joan conducts her research. She travels with locals (that would be me). She isn’t afraid to ask questions and is direct about what she wants. She always asks about people’s ethnic background, in order to better understand their food. She got everyone to talk, and most people responded positively, too — that was great to see. If you venture into the heart of Bnei Brak and you’re not a religious Jew, you will stand out. That said, everyone was perfectly polite to us, and all the places we visited were hospitable. Delicatess, 81 Rabbi Akiva Street. You’ll find a huge tank of cholent outside alongside trays of Jerusalem kugel, plus a massive loaf of Jerusalem kugel inside (photo above). There’s tzimmes (sweet carrots and raisins), and all sorts of potato kugels, too. Next door is a busy bakery. Interesting bit of fusion: We were impressed by the massive refrigerator case full of salads, which include at least two types of horseradish (well, this is still Ashkenazi food). Bonus deal: Buy 10 salads and get a free music cassette. Muchan Vemizuman, 17 Hazon Ish Street. Enter this unassuming storefront and you’ll find a small, two-floor deli and restaurant (top photo). We had ridiculously cheap cholent and kishke (a flour dumpling baked inside intestines). 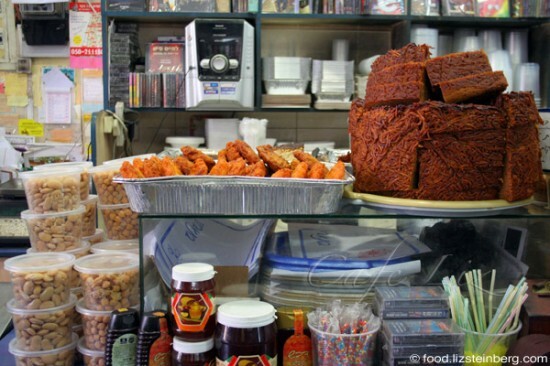 The place has classic gefilte fish, potato kugel, blintzes and meat patties. Interesting bit of fusion: “Chinese” chicken. Friedman’s, 28 Rashi Street. A small one-room affair on a quiet street where you’d least expect to find it. 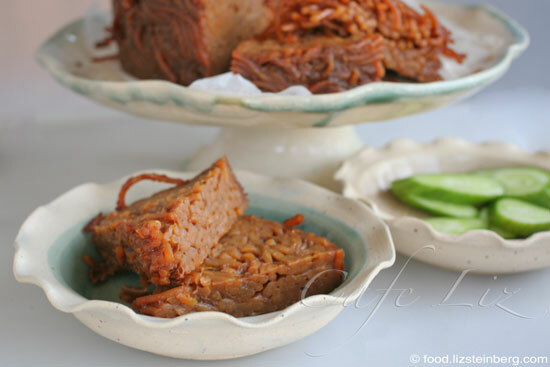 The owner, Hillel Friedman, used to live in New York, and while he won’t tell what’s in his food for fear of giving away secrets, he warmly offered us bright-orange kishke, (relatively) light cholent and fluffy potato kugel. The place also offers a bunch of pasta farfels. Interesting bit of fusion: Potato mafroum, a North African dish, smack in the center of the deli case. A Google map of these places. 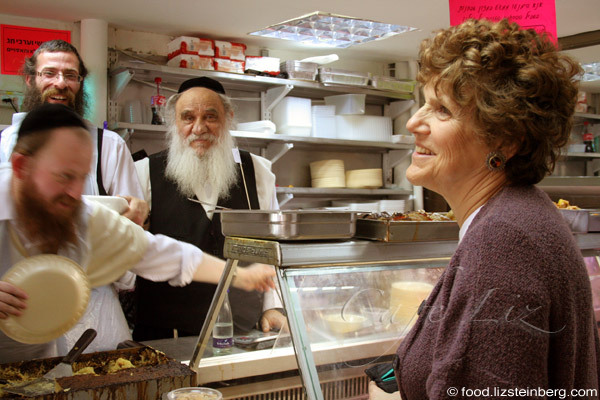 21 Responses to "Exploring Bnei Brak with Joan Nathan"
Awesome! Love the pictures and I can’t believe you didn’t take them up on the 10 salads for a free cassette deal…. what a great opputunity! Good for you and Ben for organizing such a quick culinary tour at a moments notice. My brother used to live in the heart of Bnei Brak and I remember eating lots of very Jewish foods there (always with red horseradish on the side. This is pretty awesome. Great article in Haaretz too Liz! Yeah, it was awesome! Actually, it was just me, not Ben. Ben was (coincidentally) off with another cookbook author that day! Hadn’t seen that, Daniela. Thanks. A brave effort, but you still have not succeeded in making ashkenazi food sound remotely appetizing. Incidentally, the last time I was in Bnei Brak was when my children were born, because the hospital there, Maanei Ha Yehoshua, is the only one in Tel Aviv that allows you to bring your own obstetrician. And that’s everything I know about Bnei Brak. Yael, it wasn’t really a tour. I found the places, but she knows her stuff! Mark, your comment made me laugh 🙂 I’ve heard good things about the Bnei Brak hospital’s approach to childbirth, certainly better things than I’ve heard about Ichilov. What a cool opportunity to spend the day with Joan! I would love to discover some really good Ashkenazic food; as much as I have my old favorites, I really love cooking and eating Sephardic style food. 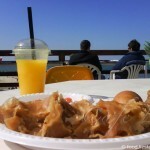 Absolutely amazing blog post, can’t wait to finish reading your article in Haaretz! My husband is Israeli who loves Sephardi food and I’m 100% Ashkenazi. I am adapting to his tastes, but I refuse to give up my kugels! He looked at the photos of Yerushalmi kugel and groaned, I think he’s afraid of what it would do to his waistline. What a wonderful opportunity for you to take Joan Nathan on a food tour! I hope she uses it in her next cookbook and I can’t wait to pick up her latest one once I find it in Jerusalem! Just found your blog via Ari Cooks. Oh my goodness, I would totally lose it if I got to spend an afternoon with Joan Nathan. As it happens, I actually read your Haaretz article yesterday, so it was quite fortuitous that I came across your blog today. Can’t wait to start exploring it. Wonderful post and wonderful article. What a treat it must have been to meet Joan Nathan. Just curious…did Joan speak Yiddish to the B-Brakers? Thanks Miriam 😀 I think there’s a place for both the old originals and modern twists. There’s no saying the modern versions will ever catch on, though. All business was conducted in Hebrew or English. Our hosts spoke Yiddish amongst each other.